You are browsing the archive for Lovecraft News. Halloween in Providence is an experience for anyone who adores the “holiday” of Halloween. Celebrating the day like many other Providencers(?) excites one because of the vibrant energy from the young populace. The charge from the air and the dark ambience of the city makes Providence as a Choice town to celebrate Halloween in. Wearing our costumes throughout the day, Tabatha and I started the day exploring by taking the H.P. Lovecraft Archive’s Walking Tour. This is a must for anyone planning on taking this journey. If you are any sort of a horror-fiction fan, the H.P. Lovecraft walking tour takes you on a journey into the past of Providence exploring the same footsteps of both Lovecraft and Edgar Allen Poe. Lovecrafts home from 1927-1933 – this house is by several incredibly expensive homes that are part of The Case of Charles Dexter Ward. These houses are beautiful and large and the mile stretch is a brisk walk from the Old Court. 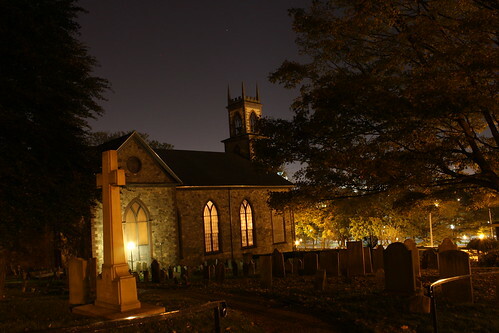 The Church of St. John is home to an ancient gravesite that contains many churchgoers of the late 1700s-1800s. Poe and Lovecraft both frequented this site and looking at these headstones you can see some names that stand out in their stories. Halloween was spent along the dock celebrating with locals in a karaoke party at The Hot Club. A definate must for anyone who’s looking for a great bar in Providence. The party had a soundtrack of drunkards wailing with a backdrop of Halloween 3: Season of the Witch playing on the screens. “It’s time. It’s time…It’s time for the Silver Shamrock givaway”. Old Court B&B: One thing about staying at the Old Court, it provided the perfect backdrop to the Lovecraft Tour. It provides the ideal atmosphere for a journey in to the world of Lovecraft and Poe. It’s an old Victorian House decorated with perfect lighting and wooden furniture. If you plan on visiting, I can’t recommend a better place. Hope Club: A country club with an extraordinary house. This club has been a private social club for Providence locals from the late 19th century. Beautifully decorated it even has memorabilia from its early days including Radios of the time. It’s worth a visit. Pictures will be posted in the future as soon as I’m back.